Plug-ins : Multiple tracks analysis. Plug-ins : Maximum equalizing power! Plug-ins : This amp actually goes to 11! 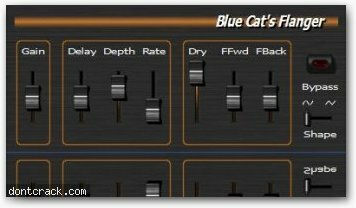 Blue Cat's Flanger effect is very versatile: it may sound very harsh and metallic or on the contrary very soft. You can obtain a wide range of sounds with this plug-in. The included factory presets will make you explore the capabilities of this effect. This flanger is a mono effect.